“Man, it’s a lot of fun to have these Team Penske cars fast again in the Xfinity Series,” said Logano who led 106 laps in winning for the first time this season in his first-ever Las Vegas start in the series. “Man, it feels good. 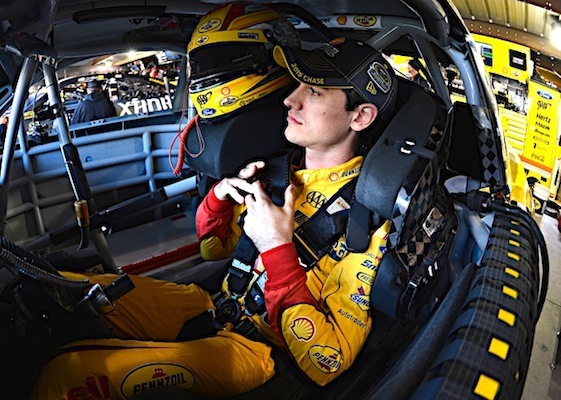 Logano took over eighth place all-time in career Series victories. Kyle Busch led each of the 45 laps in Stage 1 but faded to seventh at the finish after the handling of his No. 18 Joe Gibbs Racing Toyota deteriorated in the second half of the race. Brad Keselowski, Logano’s teammate, won Stage 2, but Keselowski brought the No. 22 Mustang to pit road for an unscheduled stop on Lap 108 because of a loose wheel and recovered to finish 10th. Daniel Suarez ran third, followed by Justin Allgaier—the highest finishing series regular–Austin Dillon and Darrell Wallace Jr.
(4) Joey Logano(i), Ford, 200. (7) Kyle Larson(i), Chevrolet, 200. (3) Daniel Suarez(i), Toyota, 200. (13) Justin Allgaier, Chevrolet, 200. (5) Austin Dillon(i), Chevrolet, 200. (16) Darrell Wallace Jr., Ford, 200. (1) Kyle Busch(i), Toyota, 200. (14) Elliott Sadler, Chevrolet, 200. (10) Ryan Reed, Ford, 200. (2) Brad Keselowski(i), Ford, 200. (20) Cole Custer #, Ford, 200. (19) Blake Koch, Chevrolet, 200. (8) Daniel Hemric #, Chevrolet, 200. (18) William Byron #, Chevrolet, 200. (12) Brandon Jones, Chevrolet, 200. (11) Brennan Poole, Chevrolet, 200. (15) Aric Almirola(i), Ford, 200. (27) Ryan Sieg, Chevrolet, 200. (22) Drew Herring, Toyota, 200. (21) Dakoda Armstrong, Toyota, 200. (28) Michael Annett, Chevrolet, 200. (23) J.J. Yeley, Toyota, 200. (24) Spencer Gallagher #, Chevrolet, 200. (9) Ty Dillon(i), Chevrolet, 199. (26) Ross Chastain, Chevrolet, 199. (25) Jeremy Clements, Chevrolet, 198. (31) Harrison Rhodes, Chevrolet, 198. (37) David Starr, Chevrolet, 197. (34) Garrett Smithley, Chevrolet, 197. (36) Joey Gase, Chevrolet, 196. (29) Ray Black Jr., Chevrolet, 196. (35) Martin Roy, Chevrolet, 196. (32) Timmy Hill, Toyota, 195. (6) Matt Tifft #, Toyota, Accident, 191. (17) Brendan Gaughan, Chevrolet, 189. (33) Jeff Green, Chevrolet, Accident, 177. (39) BJ McLeod, Chevrolet, Brakes, 159. (38) Brandon Hightower, Chevrolet, Vibration, 18. (40) Stephen Leicht, Chevrolet, Accident, 4. (30) Jordan Anderson(i), Chevrolet, Electrical, 1. Average Speed of Race Winner: 118.525 mph. Time of Race: 2 Hrs, 31 Mins, 52 Secs. Margin of Victory: 0.602 Seconds. Lap Leaders: K. Busch(i) 1-48; K. Larson(i) 49-74; J. Logano(i) 75; K. Larson(i) 76-80; B. Keselowski(i) 81-92; J. Logano(i) 93-142; K. Larson(i) 143-144; J. Yeley 145; J. Logano(i) 146-200. Leaders Summary (Driver, Times Lead, Laps Led): J. Logano(i) 3 times for 106 laps; K. Busch(i) 1 time for 48 laps; K. Larson(i) 3 times for 33 laps; B. Keselowski(i) 1 time for 12 laps; J. Yeley 1 time for 1 lap.